Windows cannot open this program because it has been prevented by a software restriction policy. 12/15/2006 I finally caught up with the times and replaced my AC97 audio with a SoundBlaster Audigy. The difference is quite noticeable. I also recently discovered EAC or Exact Audio Copy, a freeware program that accurately transcribes your audio CDs to WAV files. The combination of EAC and a decent sound card essentially turns your PC into a high-end CD player. 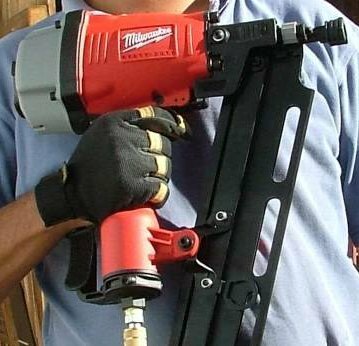 11/15/06 I purchased my fourth pneumatic nailer. This beauty is a framing nailer that shoots 2″ to 3 1/2″ nails. It makes quick work of many tasks around the home. By the way, did you know that “he who dies with the most tools wins”? 11/3/06 Today is my last day at Citigroup and two days after my 7th anniversary. Company management decided to eliminate the Diners Club systems development group based here in Denver. My job was among 168 of those affected. It’s a shame because it was probably the best software development team within Citigroup. 7/15/06 I have decided to install security cameras around the house. One thing that I needed was connectors for 75 ohm RG6 cable. Most RG6 connectors are the ‘F’ style, while most security cameras use BNC connectors. I also needed replacement solder-tab batteries for our Interplak toothbrushes. After checking with several suppliers, I placed my order with All Electronics Wednesday evening. The parts arrived via USPS Saturday afternoon — very quick turnaround! 6/25/06 We have to relocate our gas meter. The utility and the building department have pretty stringent requirements for this, so Friday I took the Denver homeowner’s plumbing exam and pulled a plumbing permit. The plumbing inspection requires that you pressurize the gas line to 10 PSI and connect a gauge. You must demonstrate to the inspector that the gas piping can maintain pressure for at least 15 minutes. Not having a suitable gauge or test fixture, I went General Hardware, purchased a few parts and the built one shown here. 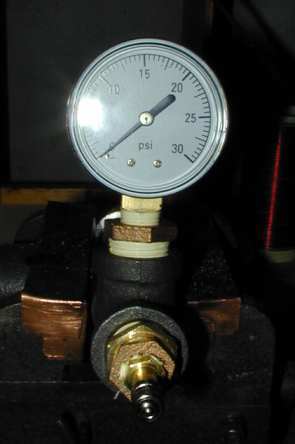 The parts include a 0-30 psi gauge, a Schrader valve for applying and bleeding the compressed air, a 3/4″ tee, and the necessary reducers for the gauge and the Schrader valve. 6/19/06 A colleague recommended a really useful site for finding useful security tools: http://sectools.org/. Fyodor, the creator of Nmap, and the maintainer of the site http://www.insecure.org, surveyed security professionals and created a listing of the 100 most popular security tools. Many of these tools have multiple uses. For example, the Paros proxy is a useful tool if you maintain and troubleshoot web sites. 6/1/06 Are your favorite troubleshooting tools not installed on the machine that you are currently working on? One solution is to install your applications on a USB drive a site called PortableApps.com has a number of applications that have been built to run off of a USB or CDROM drive. 4/20/06 Hooray for the retarded kid! I finished up the OS course and took a DANTES exam. Only 7 semester hours to go! 2/21/06 Two useful measures of energy density are Watt hours/Liter (volumetric energy density) or Watt hours/kilogram (gravimetric energy density). A gallon of gasoline has an energy density of 9000 watt hours per liter while a lead acid battery has an energy density of 40 watt hours per liter. This helps explain why electric cars are not yet common. Liquid hydrogen has a substantially lower volumetric energy density than gasoline, only 2600 watt hours per liter. Don Lancaster has an excellent tutorial on energy fundamentals: http://tinaja.com/glib/energfun.pdf. 1/6/06 Downloaded and installed GIMP on Linda’s XP computer. GIMP stands for GNU Image Manipulation Program. It seems to be a nice alternative to Photoshop. 1/2/06 Hooray for the retarded kid! I’m finishing up my last fourteen semester hours of undergraduate work. Today I am starting a course on operating systems. 12/28/05 Used an updated version of a familiar utility autoruns.exe from the sysinternals.com website. There are all sorts of places within Windows that a program can be automatically launched. This includes services as well as programs launched as the logged-in user. These guys seemed to have figured it all out. e Displays the environment as well as the parameters to the command, up to a limit of 80 characters. ew Wraps display from the e flag one extra line. eww Wraps display from the e flag as many times as necessary. u Displays user-oriented output. This includes the USER, PID, %CPU, %MEM, SZ, RSS, TTY, STAT, STIME, TIME, and COMMAND fields. v Displays the PGIN, SIZE, RSS, LIM, TSIZ, TRS, %CPU, %MEM fields. w Specifies a wide-column format for output (132 columns rather than 80). If repeated, (for example, ww), uses arbitrarily wide output. This information is used to decide how much of long commands to print.